You spend so much time seating at your desk. Don’t you think it should be a bit more special? At Bevlan you will find a perfect desk to match your needs and taste. There is so much to choose from… Modern Glass, or Contemporary Wooden Designs? Small, or Large? Sitting, or Standing? Our wide range and incredible configuration options will let you make the most out of your choice. And if you are still not sure, visit our showroom to see our products in person. You will not be able to find a bigger showroom in the north-west. It’s officially the biggest! Bench desking is Ideal for call centres and teamwork that requires large office desk areas. 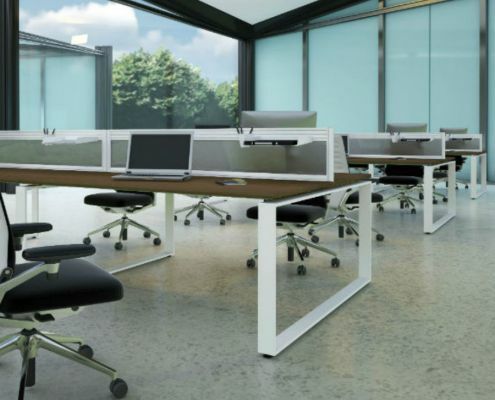 Our extensive range of bench desks optimises style, function and space. Keeps your team happy and productive in any environment. 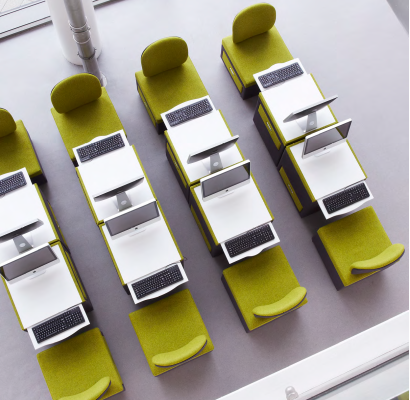 Bench desking is not only functional, space efficient and comfortable, but also ideal for large open spaces. 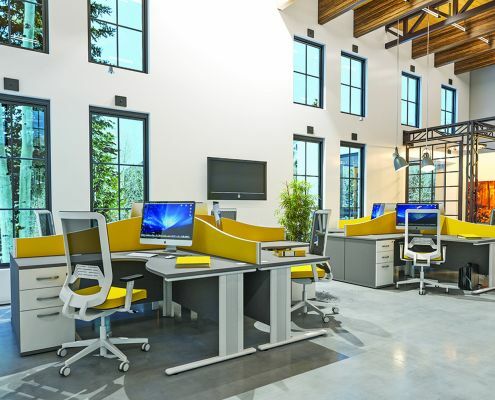 Hot desking offers both a collaborative work environment and a private zone, depending on what is needed. It enables employees to work from anywhere within an office, whether from a table with colleagues or in a conference room. Using a hot desk system in the workplace also helps to establish trust among colleagues which boost that important factor of staff morale. So why not have a browse at our selection and see if hot desking works for you. When it comes to creating a comfortable and productive workspace, getting your office desk right is absolutely essential. Here at Bevlan, we understand that every workplace is different, so our wide range of office desks includes solutions to suit every need and budget, helping you create a flexible workspace that not only looks good but has style, quality and meets your budget. Our executive office furniture ranges offer complete flexibility combined with function, style and a choice to suit every budget. Whether you are looking for a traditional desk or a contemporary desk we have the perfect executive desk for you. We offer a range of sit-stand adjustable height desks online. Correct desk height is an important element of achieving good working posture. Help reduce the risk of back pain and other related conditions experienced by computer screen users. 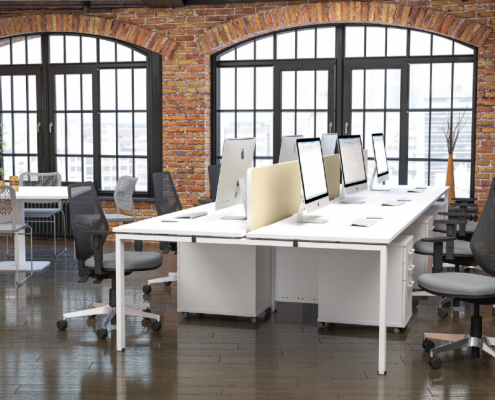 The ability to transition between working whilst sitting and standing is the main feature of this range of office desks, however, we understand that style also plays a crucial part too. Our range of sit-stand adjustable height office desk includes a wide choice of colours and styles to suit any office environments and to cater to all needs. Our selection of desktop screens has more than one purpose in an office. Acoustic dampening, as well as separating the desks to provide more privacy, are just a few of them. Choose from a wide range of desktop screens that will provide you with a stylish and practical way to divide desks, particularly in a busy and potentially noisy working office environment. Why not have a look and see if your office would benefit from desk mountable screening configured especially for you from a variety of shapes, sizes and fabrics. These days, open plan offices are common, but this doesn’t give employees the peace and quiet and privacy they need to get the job done. That’s where office divider screens can help, by preventing day-to-day distraction in the workplace. By using floor standing screens you get a flexible room which enables you to go from open plan to private in a very short time. Floor standing screens come in a variety of sizes, from fabric to acrylic, with freestanding feet to castors and with linking stripes to create runs. 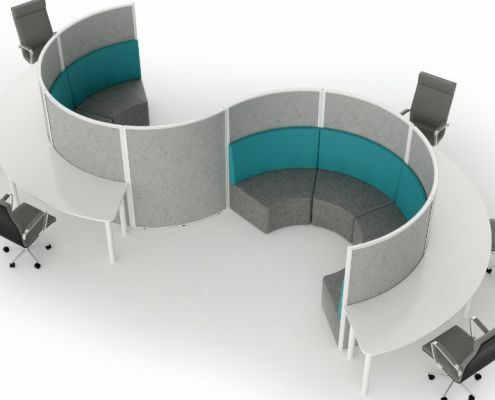 Moveable designer office partitions Movable designer office partitions are ideal for creating flexibility in your room.